I am well used to 'information overload' but now that I have collected the data for my thesis I have 'data overload'. Ontology, epistemology, axiology, methodology, what the ology??? sorry just thinking I might need a drink to get me through this!!! Realising a large amount of my time and efforts are currently spent on content creation…generating ideas and information that appeal to our students, library users and the wider audience. Anyone have an J, N, U or X they can recommend? SoundCloud is the world's foremost social sound platform where anyone can listen to or produce audio and share them. I set up an account for GMIT Libraries as another means of reaching our library users. The main purpose being to provide library instruction to support learning. We already use YouTube for instructional purposes but decided that studetns may utilise Podcasts on the go; with the abitly to download and listen to them on their own devices. Podcasts are convenient and easy to consume - checkout GMIT Libraries on SoundCloud today! 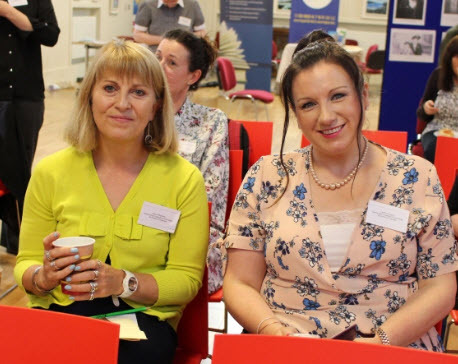 This years Western Regional Section of the Library Association of Ireland’s annual seminar took place in Ballinasloe Library on Monday 11th June 2018, centering on the theme of challenging times. The programme was thought-provoking and diverse. ​Maura Stephens and I presented on the trials and triumphs of going open source which was based on GMIT Libraries experience of migrating to a web-based open-source integrated library system. GMIT Libraries went live with Koha, a little over a year ago. It’s safe to say that not only has the past year been challenging but the period of implementation prior to going live was also extremely demanding. Koha is “the most advanced open-source Integrated Library System in use today by hundreds of libraries worldwide” (http://www.koha.org/about). Koha is a fully featured Integrated Library System (ILS), there is no cost for the license, you have the freedom to modify the product and adapt it to your Library’s needs. This presentation concentrated on GMIT Libraries experience of planning, implementing, using and reflecting on Koha together with considering the other parties involved with supporting Koha, including Interleaf Technology, PTFS Europe and EduCampus. We discussed the software installation, data entry, data migration and UAT’s before going on to deliberate exploiting Koha. We discovered that we needed to do a great deal more work than anticipated to adapt the software to local needs. The dialogue focused on the benefits and drawbacks of implementing and using Koha. Discussing the stability, adaptability and user friendliness of the system, along with the availability of core modules together with their completeness and productivity. Koha currently supports the following library functions in a relatively easy to use interface: circulation, acquisitions, cataloguing, serials and the OPAC. With the latest Koha release there is basic framework built into the system for adding ILL support and workflows; this is somewhat a work in progress. The presentation also included a synopsis of integrating a discovery service, an app for online past exam papers and a shared institutional repository. View selected output from my engagement in the Teaching & Learning Programme. My journey to obtaining a professional qualification in teaching and learning began by chance; a colleague recommended the ‘Research Cycle’ module to me and so the story begins. The research cycle was a truly challenging module, but a module that has been the basis of all the modules that followed. 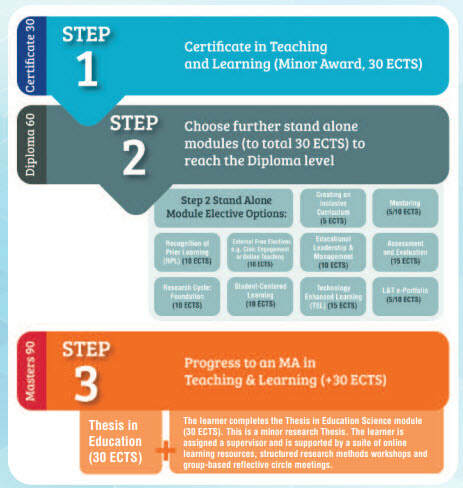 After completing the research module, I believed that I would be capable of fully engaging with and completing other modules available to progress and earn ECTS credits towards a Diploma in teaching and learning. I am pleased to have completed the research cycle at the beginning of my journey, as for me, this was the toughest module, but the reward of ‘getting published’ was unrivalled, and the support of the facilitators was invaluable. Applying relevant research and data ensures an evidence-based approach to my teaching practice. The combination of modules available, and in fact participated in, allowed me to explore new ideas. Embedding new strategies in my teaching practice and collaborating with academics through discussion boards, peer assessment and feedback has meant that I approach my information literacy skill teaching more creatively. Using tools and technology to engage students, encouraging them to achieve the learning outcomes of the library instruction sessions. The systematic process offered really allows you to focus fully on a particular module sequentially encouraging knowledge and understanding of the role of teaching in third level education. The certificate is the most recent module I have participated in; this reflection is in fact the final task I need to complete before the submission date. The other modules I have completed, and received a single subject award for are, as mentioned, the Research Cycle, Technology Enhanced Learning and the Learning & Teaching e-Portfolio. Consequently, if I an successful in this module I have enough credits to attain the Diploma in Teaching and Learning, which is exhilarating. The certificate module was hugely valuable in introducing me to the theories of teaching, learning and assessment. Given that, I am not an academic I found the certificate challenging to say the least. Challenging in a positive way, I have gained theoretical and practical understandings of what it means to be a teacher/academic in higher education. Throughout the module, we were encouraged to engage face-to-face with peers on the course through course days as well as online, using tools and discussion boards. A number of informative guest speakers contributed to the module, delving into diverse issues in higher education, and the impact such issues have on teaching practices. The module has certainly enhanced my understanding of the practices required to teach in third level education. Since I am not in an actual teaching role, as part of the module, I was required to ‘shadow’ or observe other academics within GMIT to gain a deeper understanding of teaching practices. Through these observations and my extensive teaching of information literacy skills and library instruction sessions I feel I was fully committed to the certificate. As a professional librarian engaged in information literacy skills training I believe this module has contributed to both my knowledge and skills of teaching and learning in higher education. The assessments incorporated within the certificate were frequent and varied. I genuinely benefited from designing lessons for the library sessions I deliver as part of my current role. I strive in helping students, staff and researchers with their information needs using a mixture of traditional information literacy skills and emerging technologies. The peer review by colleagues engaged in the certificate gave me structural and meaningful feedback to enhance the library instruction sessions. My peer reviewing my colleagues allowed me to gain a more thorough insight into teaching practices as well as giving them feedback on their teaching. One of the objectives of the certificate was to develop an e-portfolio. Although I had previously successfully completed the learning and teaching e-portfolio module my portfolio did need bringing up to date to meet the criterion for the certificate. As I previously created an e- portfolio I found that I was able to advise my colleagues on the advantages of using the Weebly platform to develop their online portfolios. This prior learning also allowed me more time to think about updating the components of my learning journey thus far. Subsequently, I believe that my e-portfolio now documents and showcases my updated skills and abilities, demonstrating my competencies both as a librarian and as a educator. My e-portfolio includes resources, accomplishments, learning objects, lesson plans, critical reflections as and a research paper. It informs readers on both my philosophy of education and my philosophy of librarianship. The blog incorporated in my e-portfolio is an up-to-date personal commentary. My aim is to continue to keep my blog updated as a medium for my roles as librarian, educator and learner. Many of my blog posts concentrate on emerging technologies. My passion for technology was the reason I chose to participate in the technology enhanced learning (TEL) module; which was particularly thought provoking. TEL focuses on developing digital skills and competencies to enable participants utilise a range of educational technologies as well as exploring the use of online learning tools. A requirement of the module was to evaluate the suitability of emerging technologies in supporting student learning in higher education. I felt very at ease with engagement with this module; I strive to keep up-to-date with emerging technologies. As part of my current role I develop learning objects to provide training material, thus affording me the opportunity to evaluate the appropriateness of learning technologies and their potential benefits to learning in higher education. Engagement with all modules required a degree of critical reflection. If I am honest I found reflecting critically very demanding when introduced to the task in the first of the modules. However, I found that the more you critically reflect, the more competent you become at it. I believe that as I have progressed on my journey through the single subject award to the anticipation of being awarded a Diploma in teaching in learning I have become a more descriptive, analytical and critical in making meaning of my experiences. As a novice to critically reflecting I found it hard to see the connection between experiences and learning. However, after engagement with the modules and the critical reflection exercises which formed part of assessment I realise the process of 'looking back' really allows me to evaluate my experiences. I consider that engagement with, and completion of, the teaching and learning modules have made me develop into a competent educator. The modules work well as single awards, but as a whole having progressed to completing the diploma, although yet to be graded, I feel proficient in a range of skills which will ensure that I can bring high quality teaching and learning experiences to the students I educate. I consider that I have the knowledge, skills, and understanding of course planning, design and evaluation. Completing the diploma is crucial to progressing my continued professional development. The MA in teaching and learning is the next step; my aspiration is to be accepted on the master programme to obtain a formal qualification in education. Today marked the last of our contact hours for the Certificate in Teaching & Learning; it's been a whirlwind. I am delighted that I have almost completed Step 1 and Step 2... the deadline is next Tuesday, so nearly there and most certainly nearly ready. Fingers crossed for my 60 ECTS credits. The purpose of this research was to investigate what extent first years students participating in library instruction acquire information literacy skills. Through this research I hoped to determine if there was evidence of learning output from the library instruction sessions that complement GMIT’s Learning and Innovation Skills (LIS) module. Furthermore, it was endeavoured to obtain feedback for development of the library instruction sessions. My research question was clear and feasible and the deadlines given throughout the module ensured that I stayed focused. The instruction given throughout the module was excellent and the feedback was always helpful and reassuring. As the library sessions had not been previously evaluated I sought to obtain feedback from both students and academics. Deciding to perform a student survey and academic interviews was part of the triangulated approach which was recommended as part of the research cycle methodology. The initial intention was to incorporate focus groups as part of the triangulated approach. However, due to time constraints I decided to omit this method and use the literature review as the third method. On reflection, attempting to a literature review along with a survey, interviews and focus groups was overly ambitious in the time frame available. I do not think there was a negative impact resulting from the elimination of the focus groups, the application of a triangulated approach ensures reliability and validity, using multiple methods to gather data while conducting primary research strengthens the research (Hesse-Biber, 2010). The most challenging of the three methods was the survey, as students were slow to engage. It was my expectation that at least 90 responses would be returned, however, 83 was the number returned within the time frame. With such a low response rate there is no evidence to suggest that the sample is representative of all first year students. Nevertheless, the results are valuable, as this small scale initial research gives an insight into students’ knowledge and awareness of information literacy. From my experience completing the research I recognize that students learn information literacy skills through participation and engagement with library instruction. These findings are endorsed by the literature, as several sources indicate that students’ benefit and learn from library instruction (Oakleaf & Kaske, 2009 & McGuinness, 2006). How much they learn or benefit, according to the interview analysis, depends upon attendance, engagement and frequency of library use. The data was not difficult to analyse as the use of Survey Monkey, the free online survey software, facilitated the interpretation of results. Furthermore, the small sample of interviews comprising 10 academics meant that the use of Microsoft Excel was sufficient to conduct analysis. A larger sample set would have necessitated the use of more complex software such as NVivo. The time frame was limited; as such planning and commitment were imperative to ensure all deadlines were adhered to. One of the most rewarding components of this module was presenting at the Research Cycle Conference, as it provided me with an extra platform to share my research. Engagement with the module has also resulted in further opportunities; I have been invited to present my research paper at the 2015 IIUG Library Conference. As a result of effective time management my written article was completed in timely fashion which allowed me to invest the necessary time to ensure a comprehensive presentation was prepared to disseminate my research. The research cycle module was both advantageous and rewarding, the support and encouragement received from Pauline and Barry was excellent. Hesse-Biber, S. N. (2010). Mixed Methods Research: Merging Theory with Practice. New York: Guilford Press. McGuinness, C. (2006). What faculty think–exploring the barriers to information literacy development in undergraduate education. The Journal of Academic Librarianship, 32(6), 573-582. Oakleaf, M., & Kaske, N. (2009). Guiding questions for assessing information literacy in higher education. portal: Libraries and the Academy, 9(2), 273-286. I am pleased to have been awarded my Rudaí23 CPD Champion badge for completing all modules of the @Rudaí23 course and collecting all of the four category badges. ​And now for Thing 22... The final reflective practice of the course and alas the end of Rudaí 23. I thought I would be delighted 'doing' this final reflection, but now that I am actually doing it I am feeling somewhat lonely. Rudaí 23 has played a significant part in my evening routine over the past few months. I have used tools that I would never have considered using, tools that I hadn't heard of and indeed tools that I use in both my personal and professional life. I am thus both happy and despondent. The task for Thing 22 is to reflect on Things 19, 20 and 21, so here goes. Podcasts are digital audio files available online. I choose to complete option 2 and produced a short podcast. Option 1 would have been a more engaged option but the fact that I hadn't created a podcast in the past meant that I choose this option. I have listened to a number of podcasts, I particularly enjoy 'Librarians Aloud' as its by librarians for librarians, or indeed for those interested in the profession. I also like the 'Adventures in library instruction' series of podcasts. The tools I used for this task were Audacity for recording and SoundCloud for hosting my recording. Both tools were very user friendly and free and I would definitely use both tool going forward; in fact I plan on recording and making available a series of library instruction podcasts for our library users. Thing 20 covered library advocacy. We advocate our libraries through our mission statements, strategic plans and other library publications, but we can always do more. Thing 20 aimed to get us thinking about how we can contribute to library advocacy. I found this task both interesting and challenging. Yes, we have a mission statement along with a number of library publications but I must admit that I would have not considered such material advocacy as such. So this task really got me thinking, before the task the main way I considered advocacy was through marketing the library and promoting library activities. I was apprehensive to begin with in following the list of 9 exercises but pleased when I completed all 9 exercises provided. I believe that librarians need educating in the skills of advocacy, as library professionals we value libraries but how is that value measured outside of our sphere. We can measure the impact of our profession through engagement and impact. I hadn't regarded our physical space as a form of advocacy but in hindsight being fortunate enough to have a somewhat flagship building both within the college and beyond is testimony to such. Thing 20 goes hand-in-hand with Thing 21; professional library associations are key to advocacy; encouraging campaigns, funding and developing national strategies and frameworks. Advocacy is just one of the many benefits of engaging with professional groups and organisation. Professional groups advocate the values and functions of librarians, raising our profile as professionals. They advise, campaign, and provide forums to communicate and collaborate. They provide courses and conferences as well as recognising the pursuit of continued professional development. Professional groups akin to the Library Association of Ireland (LAI) and the Chartered Institute of Library and Information Professionals (CILIP) advise, influence and set standards. It is evident that a group of people have more influence and power than an individual, so if we value our profession we should engage with like minded professionals by joining an associated group. Thing 21 genuinely made me reassess the value of joining professional groups. As an employee I am an institutional member of the LAI and up until now have been happy with the benefits of the membership but after this task I can appreciate the more far reaching benefits of renewing my individual membership. Rudaí 23 has been a compelling course of discovery from start to finish. The reflective practice tasks really helped me make meaning of the 23 things. It's easy to skim over some tools without truly understanding how to use them. The reflective practice tasks made me think about what I did; evaluating the advantages or disadvantages of the tools, as well as exploring the value of tools relevant to our profession and the impact of library professionals. In the main I have embraced the 23 Things for information skills provided through Rudaí 23. I would like to thank the Rudaí 23 team for the enlightening course, the positive feedback and ongoing encouragement. Well done all, it’s been a pleasure!